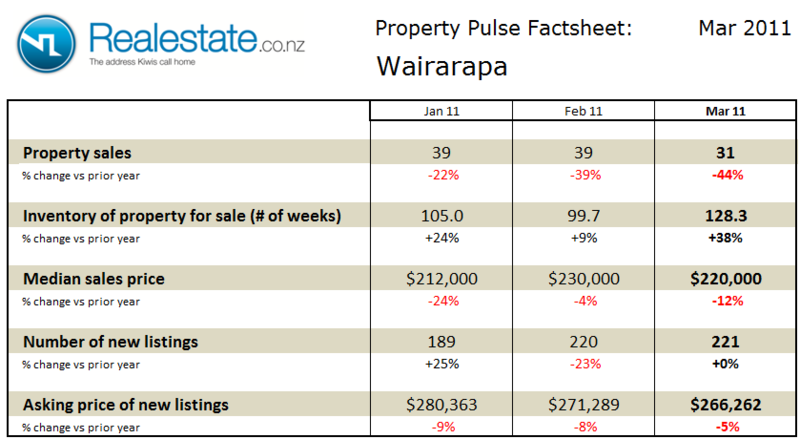 The Wairarapa district property pulse factsheet for July 2012 is published using data from Realestate.co.nz and REINZ (Real Estate Institute of NZ). Property sales in the Wairarapa district at 64 in the month showed a significant rise on a seasonally adjusted basis in July and a 33% increase as compared to a year ago. The inventory of unsold houses on the market rose sharply to 110 weeks of equivalent sales returning it to sit above the long-term average of 98 weeks of equivalent sales. Median sales price for properties sold in the Wairarapa district at $230,000 was down 3% as compared to a year ago, although it was up on both May and June. The current selling price is still some level below the level of the past few years. The asking price expectation of new listings was down 4% as compared to a year ago at $259,129. The level of new listings coming onto the market in July at 167 was down as compared to June, but up 34% as compared to a year ago. This data indicates that the Wairarapa region is a fairly balance market which is experiencing more activity than has been seen on recent years. Sales have been strong over the first half of the year whilst prices have been flat. The recent rise in inventory is ahead of sales and could tip the balance in favours of buyers with a strong selection of property to choose from. 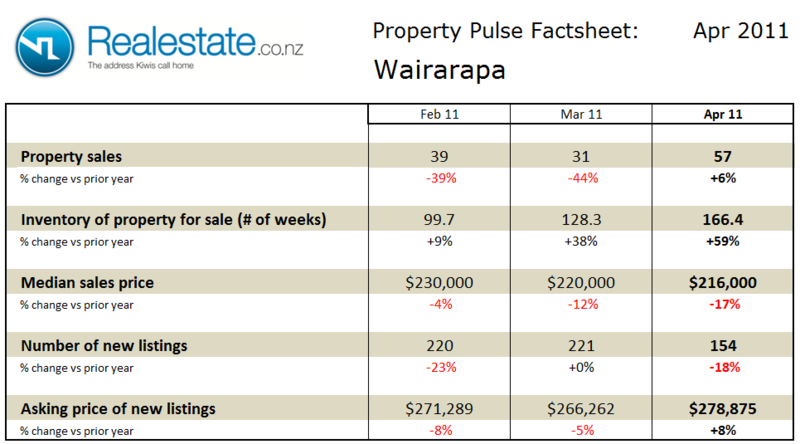 The Wairarapa district property pulse factsheet for June 2012 is published using data from Realestate.co.nz and REINZ (Real Estate Institute of NZ). Property sales in the Wairarapa district at 54 in the month showed a significant fall on a seasonally adjusted basis in June but reflected a 26% rise as compared to a year ago. The inventory of unsold houses on the market fell to 85 weeks to return to below the long-term average of 98 weeks of equivalent sales. Median sales price for properties sold in the Wairarapa district at $221,000 was up 12% as compared to a year ago and continues a steady decline through the year. The asking price expectation of new listings was down 7% as compared to a year ago at $253,874. The level of new listings coming onto the market in June at 190 was up as compared to May and up a very significant 62% as compared to a year ago. The Wairarapa district property pulse factsheet for May 2012 is published using data from Realestate.co.nz and REINZ (Real Estate Institute of NZ). Property sales in the Wairarapa district at 74 in the month showed a significant rise on a seasonally adjusted basis in May and reflected a very significant 111% rise as compared to a year ago. The inventory of unsold houses on the market fell to 107 weeks to remain just above the long-term average of 98 weeks of equivalent sales. Median sales price for properties sold in the Wairarapa district at $210,000 was down 5% as compared to a year ago and continues a steady decline through the year. The asking price expectation of new listings was up just 1% as compared to a year ago at $270,181. The level of new listings coming onto the market in May at 186 was up as compared to April and up 17% as compared to a year ago. 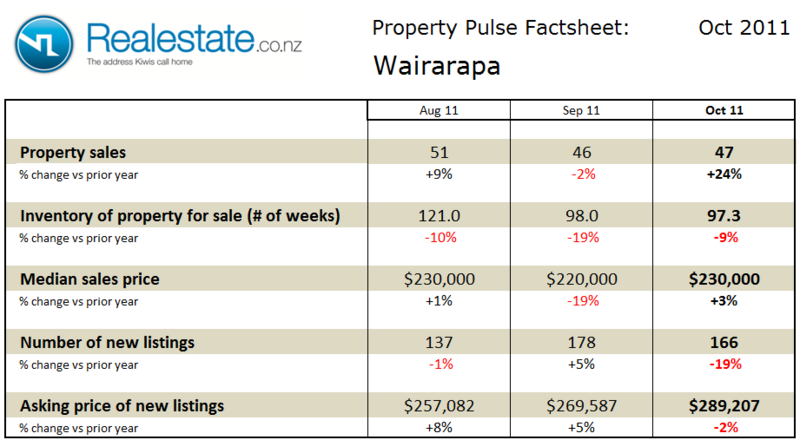 The Wairarapa district property pulse factsheet for November 2011 is published using data from Realestate.co.nz and REINZ (Real Estate Institute of NZ). Property sales in the Wairarapa district at 42 in the month showed a fall on a seasonally adjusted basis in November and reflected a significant 24% fall as compared to a year ago. The inventory of unsold houses on the market rose to 100 weeks to remain right in-line with the long-term average of 102 weeks of equivalent sales. Median sales price for properties sold in the Wairarapa district at $220,000 was down 15% as compared to a year ago and continues what has been a steady decline through the year. The asking price expectation of new listings was down 13% as compared to a year ago at $273,623. The level of new listings coming onto the market in November at 198 was up as compared to October but up just 1% as compared to a year ago. 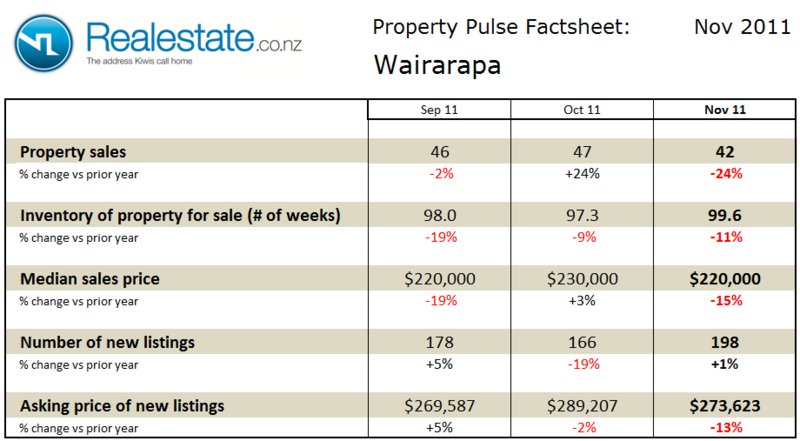 The Wairarapa district property pulse factsheet for October 2011 is published using data from Realestate.co.nz and REINZ (Real Estate Institute of NZ). Property sales in the Wairarapa district at 47 in the month showed a very small fall on a seasonally adjusted basis in October but recorded a significant 24% rise as compared to a year ago. The inventory of unsold houses on the market fell very slightly to 97 weeks to remain just above the long-term average of 87 weeks of equivalent sales. Median sales price for properties sold in the Wairarapa district at $230,000 was up 3% as compared to a year ago and up from the prior month. The asking price expectation of new listings was down 2% as compared to a year ago at $289,207. The level of new listings coming onto the market in October at 166 was down as compared to September and down a significant 21% as compared to a year ago. The Wairarapa district property pulse factsheet for May 2011 is published using data from Realestate.co.nz and REINZ (Real Estate Institute of NZ). Property sales in the Wairarapa district at 35 in the month showed a significant fall on a seasonally adjusted basis in May and fell by 36% as compared to a year ago. The inventory of unsold houses on the market did however fall to 139 weeks to remain well above the long-term average of 88 weeks of equivalent sales. Median sales price for properties sold in the Wairarapa district at $220,000 was down 8% as compared to a year ago although up slightly from the prior month. The asking price expectation of new listings was down by 5% as compared to a year ago at $278,124. The level of new listings coming onto the market in May at 159 was barely unchanged from April and down 5% as compared to a year ago. The Wairarapa district property pulse factsheet for April 2011 is published using data from Realestate.co.nz and REINZ (Real Estate Institute of NZ). Property sales in the Wairarapa district at 57 in the month showed a significant rise on a seasonally adjusted basis in April and recorded a 6% rise as compared to a year ago. The inventory of unsold houses on the market rose sharply to 166 weeks to remain well above the long-term average of 87 weeks of equivalent sales. Median sales price for properties sold in the Wairarapa district at $216,000 was down 17% as compared to a year ago and down from the prior month. The asking price expectation of new listings was up 8% as compared to a year ago at $278,875. The level of new listings coming onto the market in April at 154 was down as compared to March and down a significant 18% as compared to a year ago. 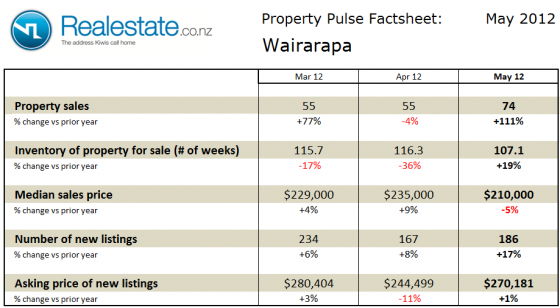 The Wairarapa district Property Market factsheet for October 2010 can be downloaded by clicking this icon. Property sales in the Wairarapa fell sharply in September down 24% from August on a seasonally adjusted basis. A total of 47 properties were sold in September. Over the first 9 months of 2010 a total of 444 properties have been sold, this compares to 523 in the same period of 2009. Inventory of houses on the market in September fell from the peak of August. Inventory now totals 121 weeks of equivalent sales. This level of inventory is considerably ahead of the long term average of 75 weeks. This would indicate that the market is favouring buyers at this time. Property prices for the Wairarapa region is included in the broad Wellington regional median property price, in September this price was $398,500 up 5.4% on September 2009 price. 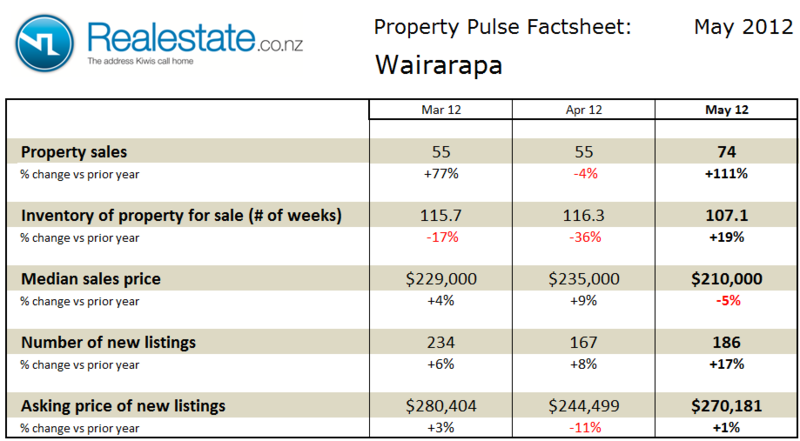 The Wairarapa district Property Market factsheet for August 2010 can be downloaded by clicking this icon. Property sales in the Wairarapa rose significantly in July up 58% from June on a seasonally adjusted basis. A total of 41 properties were sold in July. On a moving annual total basis sales are up 3.5% with 614 properties sold in the past 12 months compared to 593 in the prior 12 months. Inventory of houses on the market in July continued to rise. Inventory has been rising for 12 straight months and now totals 119 weeks of equivalent sales. This level of inventory is considerably ahead of the long term average of 75 weeks. This would indicate that the market is favouring buyers at this time. Property prices for the Wairarapa region is included in the broad Wellington regional median property price, in July this price was $385,000 up 4.1% on July 2009 price.